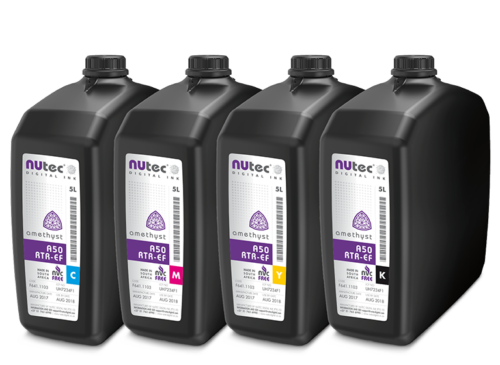 Amethyst A20-RIG-MI is a premium quality rigid UV ink, optimised for the Mimaki® JFX series flat bed printers It is a high density colour ink that cures with LED UV lamps with superior media adhesion. The Amethyst A20-RIG-MI is suitable for use with or without primer, on a large variety of rigid substrates, including: Polycarbonate, Melamine, Fluted Polypropylene as well as Decorative Applications on Glass, Acrylic and Ceramics. 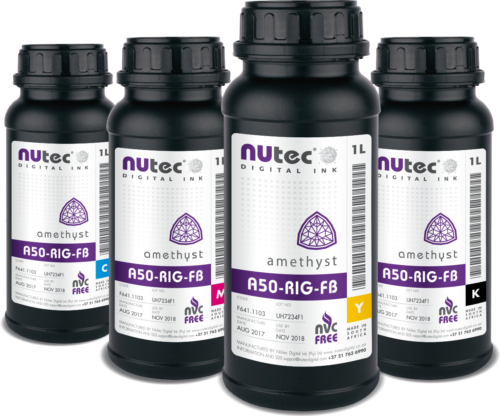 Amethyst A50-RIG-EF is a premium quality rigid UV ink, with superior media adhesion qualities, optimised for use on the EFI GS and QS series printers. It is designed for rigid applications and cures with Mercury Vapour and LED UV lamps. The A50-RIG-EF is suitable for use without primer, on a large variety of rigid substrates. Amethyst A50-RIG-FB is a premium quality rigid UV ink, with superior media adhesion qualities, optimised for use on the HP FB Series of printers. This ink is designed for rigid applications including Polycarbonate, Melamine, Fluted Polypropylene as well as Decorative Applications on Glass, Acrylic and Ceramics. 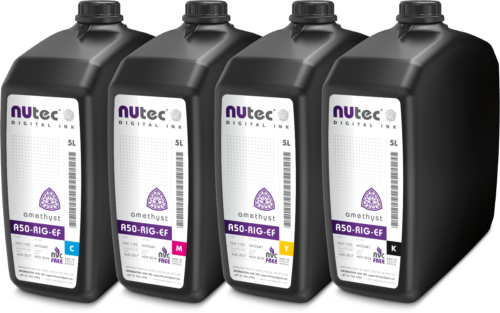 Amethyst A50-RIG-FJ is a premium quality rigid UV ink, optimised for use on the Fuji® Acuity™ Series printers. It is designed for rigid applications and is suitable for LED as well as Mercury Vapour UV lamps. It is suitable for use with or without primer, on a large variety of rigid substrates, including: Polycarbonate, Melamine, Fluted Polypropylene as well as Decorative Applications on Glass, Acrylic and Ceramics. 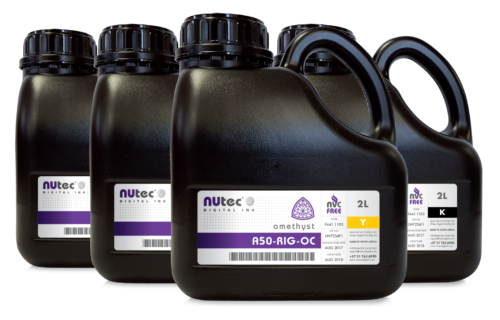 Amethyst A50-RIG-OC is a premium quality rigid UV ink, with superior media adhesion qualities, designed for rigid applications and is suitable for LED as well as Mercury Vapour UV lamps. It is optimised for use on the Océ® Arizona™ Series of printers. Quartz Q50-RTR-EF is a wide-format roll-to-roll UV-curable ink, optimised for the EFI® GS and QS roll-to-roll printers. This ink is designed for a large number of self-adhesive and flexible media applications. This high density ink cures with Mercury Vapour UV lamps. This fast curing ink is suitable for high speed printing. 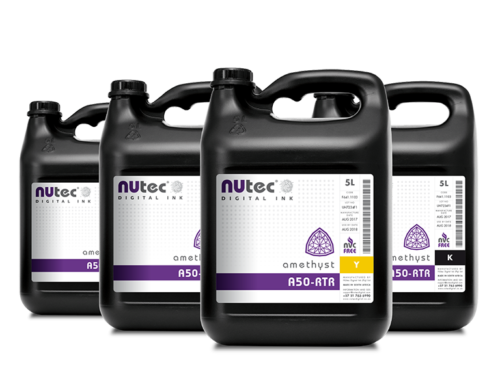 Amethyst A50-HYB-OC is a premium quality hybrid UV ink optimised for use on the Océ® Arizona TM Series of printers on a wide range of rigid and roll-to-roll applications. It is a wide format ink that cures with LED as well as Mercury Vapour UV lamps. Amethyst A50-HYB-FJ is a premium quality hybrid UV ink designed for use on the Fuji® Acuity™ Series of printers on a wide range of rigid and roll-to-roll applications. It is a wide format ink that cures with LED as well as Mercury Vapour UV lamps. Amethyst A50-RTR-EF is a superior roll-to-roll UV curable ink optimised for use on the EFI® Roll-to-Roll series printers. This flexible, fast curing UV ink is suitable for Mercury Vapour and LED UV lamps and designed for self-adhesive as well as flexible media. It performs well in a demanding, high speed printing environment, providing enhanced scuff and chemical resistance. 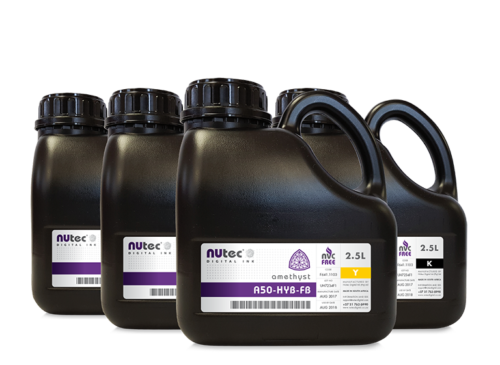 Amethyst A50-HYB-EF is a superior hybrid UV curable ink optimised for use on the EFI® hybrid series printers. This flexible, fast curing UV ink is suitable for Mercury Vapour and LED UV lamps and designed for self-adhesive as well as flexible media. 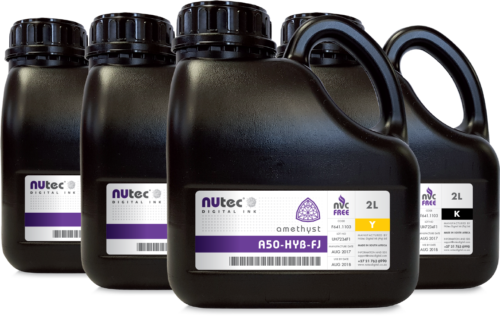 Amethyst A50-HYB-FB is a premium quality hybrid UV ink optimised for use on the HP® FB™ Series of printers, that cures with Mercury Vapour UV Lamps. The A50-HYB-FB bridges the gap between conventional rigid inks and roll-to-roll inks, providing the convenience of both in a single product. Amethyst A20-RTR is a premium quality, roll-to-roll UV ink, designed for a wide range of flexible applications. It is a high density colour ink that cures with LED as well as Mercury Vapour UV lamps. Suitable for the Ricoh Gen 5, Gen 5s as well as the Kyocera KJ4A print heads. 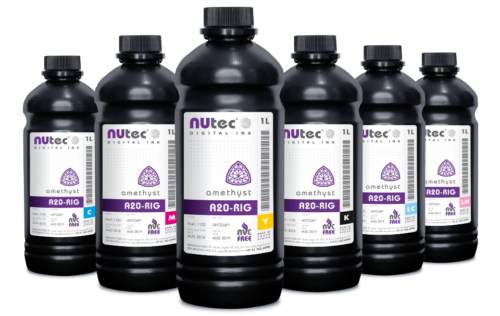 Amethyst A20-RIG is a premium quality UV ink designed for a wide range of rigid applications. It is a high density colour ink that cures with LED as well as Mercury Vapour UV lamps with superior media adhesion. Suitable for the Ricoh Gen 5, Gen 5s as well as the Kyocera KJ4A print heads. Quartz Q50-RTR is a wide-format roll-to-roll UV-curable ink designed for a large number of self-adhesive and flexible media applications. It is a high density ink that cures with Mercury Vapour UV lamps. This fast curing ink is suitable for high speed printing. Amethyst A50-RTR is a superior roll-to-roll UV curable ink. This flexible, fast curing UV ink is suitable for LED and Mercury Vapour UV lamps. The A50-RTR is designed for self-adhesive as well as flexible media and performs well in a demanding, high speed printing environment, providing enhanced scuff and chemical resistance. 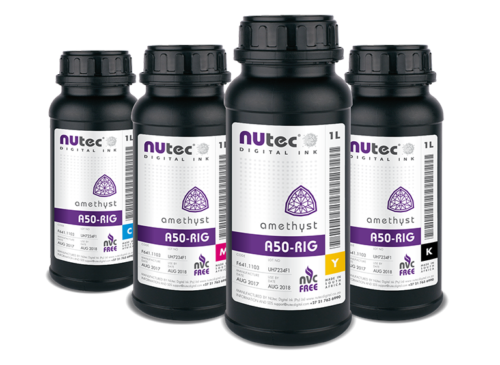 Amethyst A50-RIG is a premium quality rigid UV ink, with superior media adhesion qualities, designed for rigid applications and is suitable for LED as well as Mercury Vapour UV lamps. It is suitable for use without primer, on a large variety of rigid substrates, including: Polycarbonate, Melamine, Fluted Polypropylene as well as Decorative Applications on Glass, Acrylic and Ceramics. Amethyst A50-HYB is a premium quality hybrid UV ink, designed for a wide range of rigid and roll-to-roll applications. It is a wide format ink that cures with LED as well as Mercury Vapour UV lamps. Amethyst A20-HYB is a general purpose Hybrid UV ink designed for rigid and roll-to-roll applications and is suitable for LED as well as Mercury Vapour UV lamps. Suitable for the Ricoh Gen 5, Gen 5s as well as the Kyocera KJ4A print heads.